Nola’s spices up Tulsa’s Cherry Street with Napoleonic touches, a homage to the Roaring ‘20s and 21st-century shine. There’s a little black door by the side of an old, red-brick building on Tulsa’s Cherry Street at Peoria Avenue. Open that door, go under a chandelier of shimmering crystals and down a dimly lit flight of stairs, and suddenly you’re surrounded by the romance and swagger of New Orleans and a bygone era. 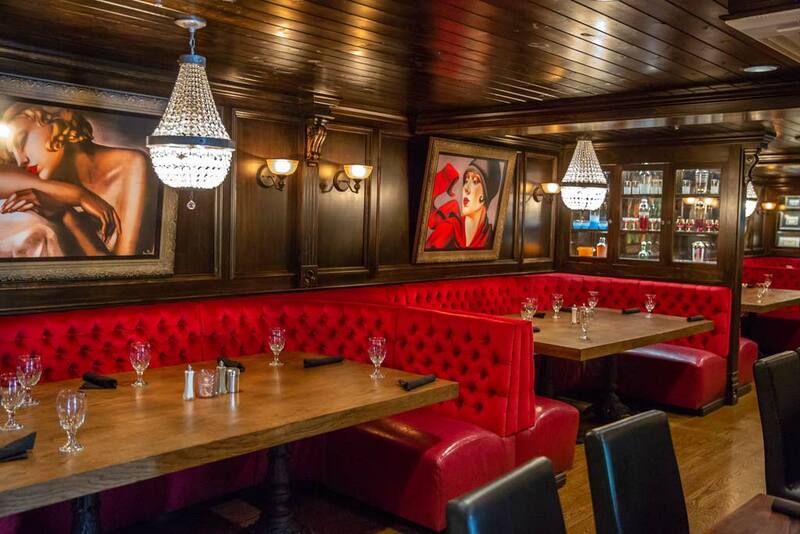 At Nola’s, you see richly stained wood paneling, more of those glittering chandeliers, red banquettes, large canvases with art deco prints by Tamara de Lempicka (and everywhere they can possibly fit) and showcases filled with astounding curiosities. There are ancient liquor decanters, 1930s cocktail shakers, old alarm clocks, candlestick telephones, little photos of ladies in cloche hats, lots and lots of books, and, in a small hall called the Prohibition Room, huge mugshots of convicts. “I love building restaurants,” says Brett Rehorn, big, burly and affable, with an air of command about him. He started out as a mechanical contractor. Eighteen years ago, he built Kilkenny’s, an Irish restaurant and bar down the street, by using designers based in Dublin and fixtures imported from the Emerald Isle, but “I’ve always loved Cajun food,” he says, so it was logical to build an homage to 1920s New Orleans. Nola’s took over a year of hard work (Rehorn is his own general contractor) and almost $2 million. “We gutted the place, and everything here is new: the plumbing, the electricity, the oak flooring,” he says. The decor blends modern with antique touches. The Napoleon Room has a fireplace and elegant chairs grouped around a starched linen table setting, modeled after a house in New Orleans where, about 200 years ago, French expatriates plotted to free Napoleon from exile. Nearby is a bar, shiny and glorious with all new fixtures, but you’d swear those white floor tiles, the tin ceiling (“It’s copied from a 100-year-old church in Quebec,” Rehorn says) and the mahogany veneer backbar were made when Jelly Roll Morton played piano in a bawdy saloon on Basin Street. Outside on the veranda during a calm summer evening, the sun kisses the old walls and green shutters from what was surely one of those 1790s Spanish-built townhouses in the French Quarter. On the other side of the bar is a little door most customers don’t see. Walk through and you’re back in the 21st century … in an unusually large, spotless, brightly lit kitchen. Each morning in the prep area, near a gleaming counter, some (un)fortunate soul stirs the roux, the flour-oil mix that’s the foundation of all Cajun food, for one hour – nonstop. In the brief downtime before getting inundated with customers, the staff relaxes. 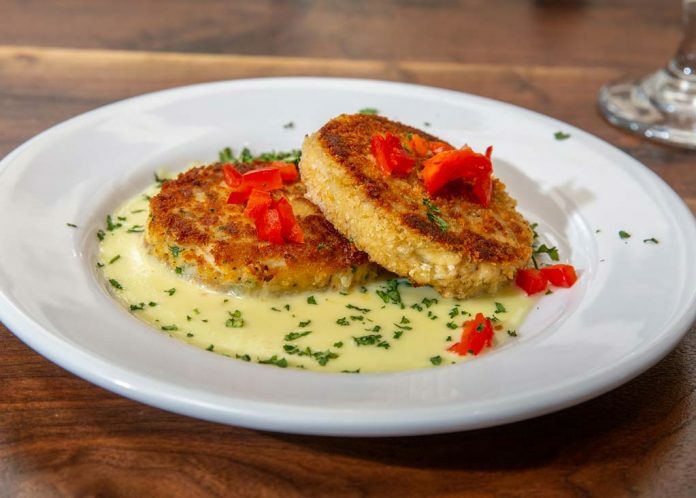 And then they start cooking – lustrous boudin, fried green tomatoes with crawfish and remoulade, turtle soup, crawfish etouffe with that rich nutty flavor signaling a roux carefully and properly made. Dishes come with endearing names. The Big Easy is a 1-pound ribeye topped with that potent etouffe. 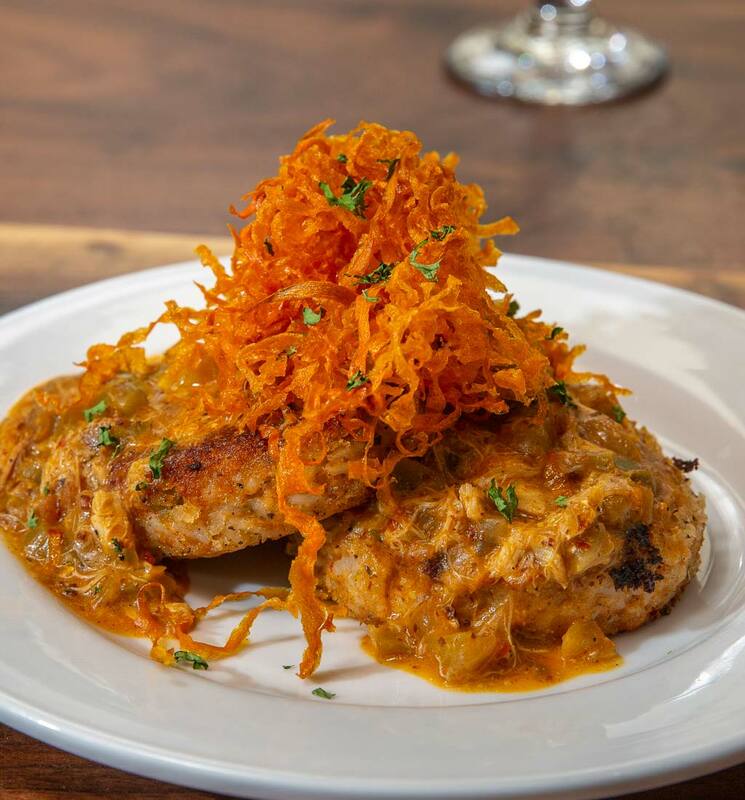 Voodoo Chicken is a fried chicken breast topped with crab, big shrimp and a decadently delicious, classic French mornay sauce. Is it an authentic New Orleans dish? By now the place is packed with a few young couples and lots of big, happy groups of all conceivable backgrounds, nationalities, dress and ages – all mixed together, mostly smiling, in the spirit of the Big Easy.